I came from the Azores, Portugal at the age of 16. I went to night school to enhance knowledge of English. 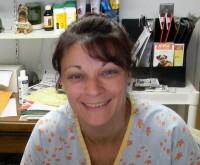 I have been working at the Fall River Animal Hospital since 1987. I have been a receptionist for a few years now and love the interaction I have with the clients and the stories they have about their pets. Of course, the best part is being able to hold a furry face in my arms and absorb all the love they have. I also enjoy my co-workers and the environment we have as a big, happy family. I started working for the Fall River Animal Hospital in 1985. I love my job, working with animals is what I've always wanted to do. I have 3 dogs and 2 cats right now, used to have a house full. Right now I am a receptionist, but I did a lot of assisting in the back before. When I'm not working I spend alot of my time with my pets in my yard. I began working at the Fall River Animal Hospital in 1999 as a volunteer. Since then I obtained my Medical Laboratory Technician (MLT) degree and became a Certified Veterinary Technician. I love working in the lab, but mostly working with the animals and being able to help them is a great feeling. Our staff is great too, we are fun, extremely caring and we try to help whenever we can. I have been working here since 2008 as a technician. I am a certified veterinary assistant and I attend continuing education classes to keep up with the changing times to benefit our pets. I live close by in Somerset with my wife and we have been homeschooling our 2 boys since 1st grade and now into their high school years. They both play for premiere soccer clubs. My favorite pets would be German Shepherds and I love training them as well. My name is Lizz and I started working here in June of 2015. I graduated from New England Institute of Technology with an Associate’s degree in Veterinary Technology and became a Certified Veterinary Technician. I now enjoy working in the lab, but my favorite part is helping the animals. Ever since I was little I knew I wanted to work with animals. I spent most of my high school career volunteering at my hometown's cat only shelter and caring for the multiple pets I had at home. I now enjoy the company of my guinea pigs, Bob and Cookie, and my dog Hobbs who I just recently adopted. I worked at the Fall River Animal Hospital in 2008. During that time I enrolled at Grooming School of CT. and became a certified groomer that same year. I work at our sister hospital, Swansea Veterinary Center, since 2010 as a Groomer and at the Fall River Animal Hospital as a receptionist. I love my job working with cats and dogs. Roberta has been working at the Fall River Animal Hospital since November 2015. I was born in Brazil but my heart is definitely half American. I moved to the United States from Brazil as soon as I graduated from veterinary school in 2015. I am currently working as a veterinary assistant while trying to validate my diploma in this country. When I am not working, I like to make my dog happy (his name is happy) by taking him for rides. I also like to spend time with my family and friends. I love the close contact I have with animals every day.